With the versatility of a material such as PERSPEX it is not surprising that today’s interior and lighting designers have found many stylish and imaginative ways to use what has become an iconic material. From the U.K's top interior and lighting designers to art school graduate QD have found an encouragement to experiment with the limits of the material. Interior and lighting design today is a fast growing limitless market with new colours, textures and shapes being introduced by material manufacturers and designers each month. QD’s approach to production is not based around the mass production market but instead focused on design and quality. Each product is hand crafted and hand finished with a pride and individuality, which stamps the product with our “Q Range” quality. This allows you the client to decide exactly how your interior will look and not how someone else thinks it should. QD can turn your visions into your realty. 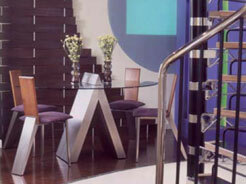 Products produced by QD for lighting and interior design projects become part of an ever-expanding range of quality items called the ‘Q Range’.. Products within the ‘Q Range’ include stair cases, tables , chairs, cabinets ,clocks, up lighters, down lighters, box lights, pennant lights and record decks to name but a few. Examples of some of the most recent products in the ‘Q Range’ are shown in the images gallery. To turn your imagination into reality, contact us with your ideas and we will guide you through the process.